Your Votes helped Undercurrents win a grant in the Digital Hero awards. 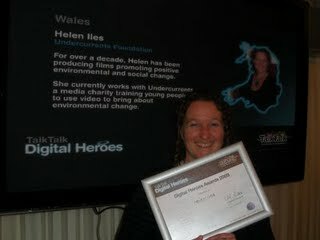 In November 2009, Helen from Undercurrents was voted the Digital Hero of Wales. "I am so happy to have been voted Wales' Digital Hero, as I know the other two local charities were incredibly deserving. A grant will allow me to tour the UK with our solar powered cinema, using films to educate young people about the environment & motivating them to tackle climate change".